Heat oven to 350°F. Place cookies and 1/2 cup pecan pieces in food processor. Cover and process until crushed. Add butter; process until mixed. Press evenly in rectangular pan, 13x9x2 inches. Bake 8 to 10 minutes or until center is set when lightly touched. Cool completely, about 25 minutes. Spread frozen yogurt over cooled crust. Freeze 30 minutes. Spread whipped topping over frozen yogurt; sprinkle with finely chopped pecans. Freeze about 4 hours or until firm. To serve, let stand at room temperature 5 to 10 minutes. Cut dessert into squares. Top each square with 2 or 3 peach slices. 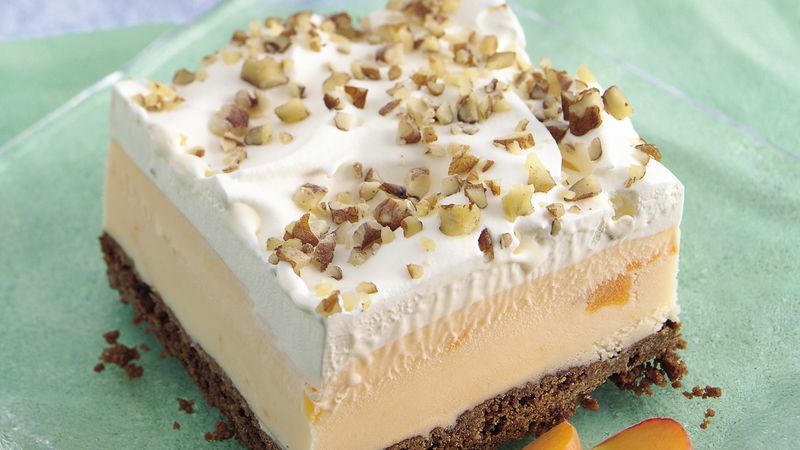 Try substituting peach ice cream for the frozen yogurt and walnuts for the pecans. The frozen yogurt needs to be just soft enough so you can scoop and spread it; soften it by placing in the fridge for 20 to 30 minutes. If you let it stand at room temperature, it will become too soft on the outside and too firm on the inside. Enhance the ginger flavor by sprinkling the peaches with chopped crystallized ginger just before serving.